The Airsoft GI Custom Classic Army ECS Skirmish MFR AEG is built for players who want a more personalized rifle. 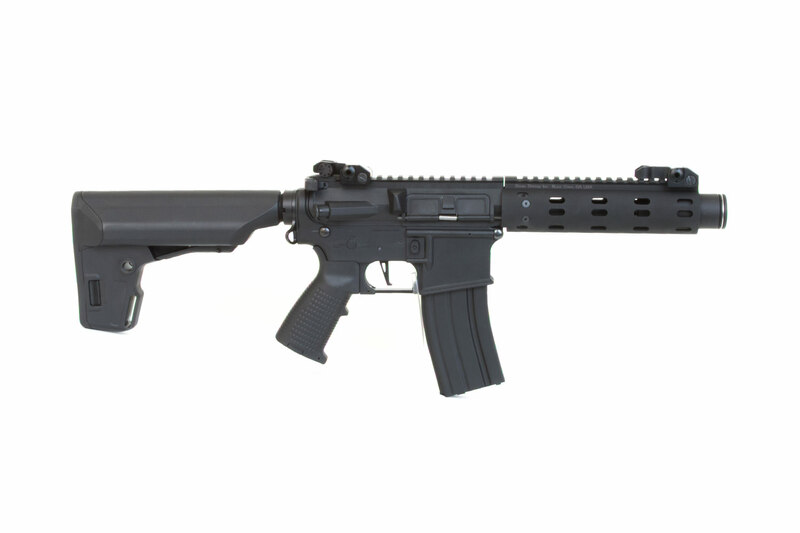 Right away, you can see the fully licensed Daniel Defense Madbull MFR Rail. 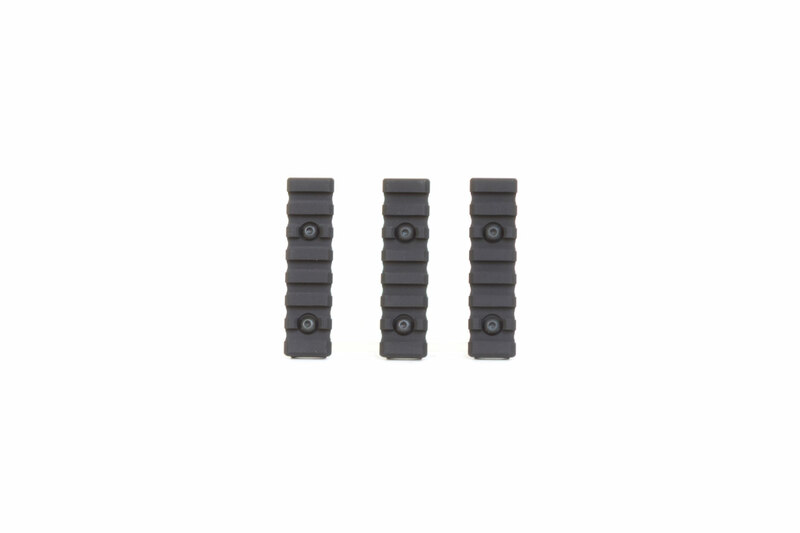 The MFR has been engineered to provide each shooter with the ultimate in modular adaptability. The tube style rail can be run "slick" with an uninterrupted top rail that runs the length of the tube. In addition, the installation of modular picatinny rails allows you to attach accessories onto the MFR system. This is great if you decide you wanted to add a vertical grip, flashlight or anything else you may need to complete your goal. Moreover, the CA Amplifier Krink Flash Hider strikes fear upon your opponents with the loud crisp noise produced shot after shot. 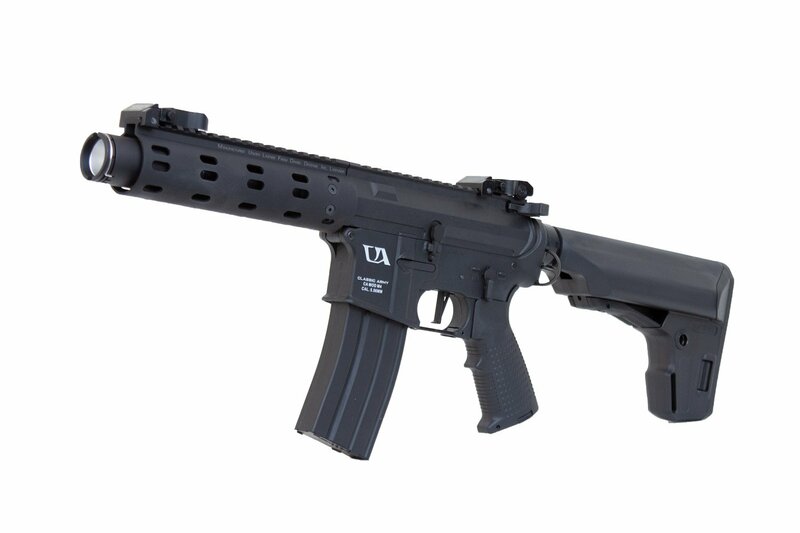 The included PTS Enhanced Polymer Stock (EPS) is a full function collapsible polymer stock that offers the user lots of flexibility. The fixed side storage compartments offer enhanced comfort and a consistent cheek weld. The side storage compartments measure up to 139 x 31 mm of spacing so you can fit 2 piece butterfly style 2/3A cell NiMH batteries or 2S/3S Lipo batteries to power the rifle. Alternatively, the compartments can be used for storage of loose batteries of various sizes. Internally, the gun has a 9mm bushing gearbox, a brand-new electronic control system, inline mosfet protected trigger contacts, 6.03mm tightbore barrel, and a quicker change spring system. Program the electronic control system to shoot at 3 to 5 round burst. 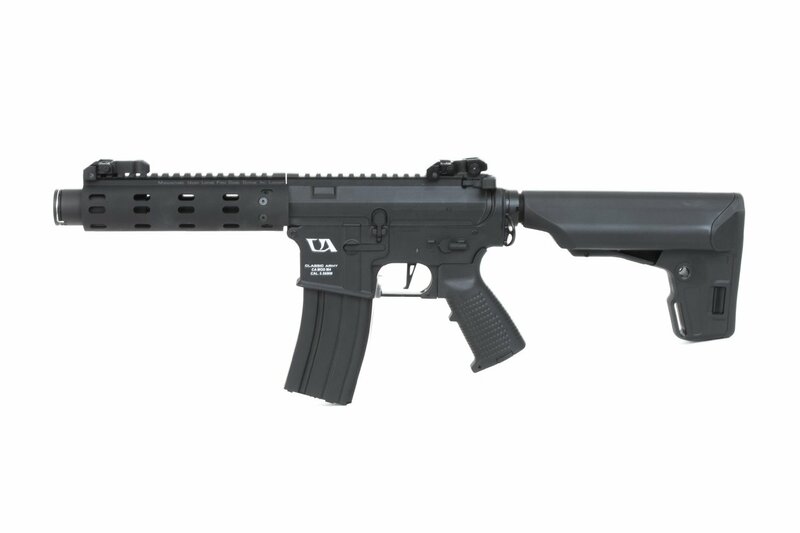 Additionally, the ECS has motor protection and low battery detection to help protect the airsoft gun in the long run. It will shoot 320-330 fps using 0.20g BBs and 900-1000 rpm using a 9.6V battery. A flat trigger is also installed that allows for a quicker response and trigger pull from the Custom MFR. Overall, the Airsoft GI Custom Classic Army ECS Skirmish MFR Airsoft Rifle is ready for your next action packed day on the airsoft battlegrounds!